Q: Think of the last name of a famous person in entertainment. The first two letters of this name are a symbol for one of the elements on the periodic table. Substitute the name of that element for the two letters, and you will describe the chief element of this person's work. What is it? Edit: Alanis Morrisette has a song entitled "Isn't it Ironic"
Blaine, I think you mean “Aluminiumanis.” In honor of the Olympics, let's let that element run its full course. I've been trying combinations for a while now. I was under the impression Zinc was an aggregate of minerals. To the contrary, it is part of the transition metals. I would include a chemistry joke, but all the good ones Argon. The new puzzle is up. I think I've figured it out. It's asking for a the name of a certain entertainer. Funny thing, I was thinking of a show on which this person used to be a regular - and it's not even on tonight! ...concerning the joke clue you left, "Aluminumanis? "; working that backwards you would get "Alanis". I know of an entertainer with a first name of Alanis, Alanis Morissette; but who has Alanis for a last name? Too polite to mention Alanis Morissette had a son called "Ironic"? Replace all the letters but one in the performer's FIRST name with the symbol for the element THEY spell, add one letter, and you name a program on which the performer worked. I thought of that one too. Interesting alternative element to this answer. Just curious... What's libertarian math? No limits? I like this puzzle a lot. I am grateful I figured it out in a timely way. But, I am hard pressed to come up with a good clue that would not be a dead give away. 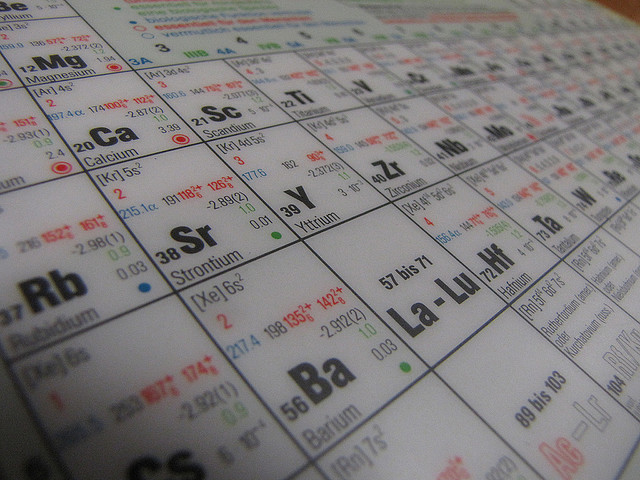 Tom Lehrer's The Elements includes the first 102 elements of the periodic table. Since 1959, scientists have named a dozen more. Specifically: Lawrencium (Lr), Rutherfordium (Rf), Dubnium (Db), Seaborgium (Sg), Bohrium (Bh), Hassium (Hs), Meitnerium (Mt), Darmstadtium (Ds), Roentgenium (Rg), Copernicium (Cn), Flerovium (Fl), and Livermorium (Lv). Does anyone know when Romney will be selecting his Vice President? I don’t want to hijack the discussion to politics, but I am from Virginia, a swing state this year. Our own Governor, Bob McDonnell is talked about as a possible vice presidential candidate as a ‘safe pick’. He is originally from Fairfax, but is now married to Richmond (a little known fact is that Richmond was the second capital of the Confederacy). Virginia was rock solid Democratic from the ‘30’s New Deal, but by the time Will Shortz attended Virginia, it had become a solid red state until Obama won in 2008. While it is too early for either party to sing the good ole’ song of victory, it will be an interesting season. I'm hard-pressed to come up with a. clue. They all seem to pale in comparison to the hidden ones above. Agreed: The easy part was solving the challenge. The hard part is coming up with a hint that doesn't give it away. This could take a while! SBD: "Give me that old time religion." Is that a dead give away??? Oxygen Iodine Carbon what you did there !! This is not a very good hint. Or is it? Frankly, Errudite, yes. It is. 1) Mr. Spatula never laid a hand on this one. 2) Fans of Whitesnake and Twisted Sister probably have this puzzle solved already (of course, that's assuming they listen to Weekend Edition---and, frankly, there's probably a better chance of seeing Mel Gibson star in the remake of Fiddler on the Roof). I have a sneaking suspicion the symbol is completely different from the element. But I haven't really looked into the puzzle much. Just figured it out. A bit tricky if you ask me. Hardy har har! I had a boring chore I finally had to tackle before attempting to solve the puzzle this morning. I’d been putting it off for quite a while and things had really started to pile up. The first three letters of the person's name spell the first name of a well known fictional character. The second, third and fourth letters of the person's name spell the first name of a semi-well known television personality. I ain't kidding. Re: the famous person's work - not a fan, yet I was able to solve anyway. I'm just glad that, unlike last weekend, they didn't have to update the online clue. Switching between the two clues rattled me a little. I had a rather bad feeling about this puzzle from the start, but I did finally get the answer. I didn't expect to return to town and find this week's puzzle was a period piece. I think this entertainer has a solid core of fans, even though I could take or leave his/her particular act. Jackass Alfredo! Does it usually come with noodles? I give up. I can't figure this one out. I have faith that you'll figure it out. Me neither, Mr. Solo. No good clues on this blog either. The answer came to me while listening to NPR Sunday morning and putting on my crisply creased trousers for church. John K., a penny for your thoughts? Oh well, at least it's a lovely day for drinking. Hot, humid, and unsettled. I might have to recycle my clue from a couple weeks ago about a particular London landmark. The Olympic opening ceremony; at the transition to the Industrial Age; the rolling up and removal of grass; was this a mime of a retort aimed at a critic who had the cheek to doubt the quality of the event's organisation? "I had a rather bad feeling about this puzzle from the start, but I did finally get the answer." Definition of FEY, "Marked by a foreboding of death or calamity." I found this puzzle interesting, but I believe it is also flawed. Since I don't watch TV except rarely, I may be mistaken, but I do not think Tina Fey is known for using irony. She is known for satire, parody and sarcasm, but I cannot recall her using irony. When I think of a performer who is known for using irony the name that comes immediately to mind is Steven Wright. How ironic would that be; to pick Wright and have it be wrong? TINa FEy worked on SNl with IRONy. The London Eye is a ferrous wheel. Such a dark (but accurate) meaning for FEY. I was thinking of the "unconventional, crazy" meaning, to which I attach a sense of lightness or ease, which accounts for the easy solution, and of course finding a proper hint was hard, as IRON. "This could take a while!" was an oblique reference to the Iron Age. "I've been trying combinations for a while now. I was under the impression Zinc was an aggregate of minerals. To the contrary, it is part of the transition metals." Zinc is element number 30, and an aggregate of minerals is also known as a rock. Put them together, and you get 30 Rock, the name of Tina Fey's comedy show on NBC. The image hint had nothing to do with the image, and everything to do with the string of eight digits in the URL. 22112639 can be split into 22, 11, 26, 39, which when matched with the corresponding elements becomes Titanium, Sodium, Iron, Yttrium. In other words, Ti, Na, Fe, Y. Following this pattern, Blaine's corresponding sequence of digits is 5, 57, 53, 49 - Boron, Lathanum, Iodine, Neon. B La I Ne. "I'd like to keep up with politics, but... Ugh, I can't stand cable news. Ever try watching for more than five minutes? Talentless idealogues narrating absolutely facile editorials. Yeech. I revile opinion news. (Yes, I'm aware that this is, itself, an opinion.)" "...Talentless idealogues narrating absolutely Facile editorials. yeech. I revile opinion news. (yes,..."
And finally, an appropriate clip from 30 Rock. A couple curious Reddit links. indicating this puzzle has been known about for at least eight months. Jan already pointed out my Ferris/Ferrous pun. My other clues were Solid Core, which referred to Earth's solid core of iron, and faith, which sounds similar to Fey. And, of course, the Spanish word for faith is .. ? Will someone please explain how irony is a "main element" of Tina Fey's "work?" I offered the musical clue of Paul Simon because the singer/songwriter has reportedly hosted SNL more than any other person. But, in honor of the puzzle, I'm now referring to Pamela Anderson as "SiBreasts"
I don't know where you heard that, but the award for most times hosting SNL goes to Alec Baldwin and coming in second by one is comedian Steve Martin. Ditto on that. In fact Steve Martin hosted once even though he had a severe head wound from an arrow. Beyond the call of duty. My clues - "hard-pressed" was reference to ironing; "seem to pale in comparison" - "pale in" was reference to Sarah Palin. Wayne Newton (Ne-neon) - neon lights of Las Vegas where he does his gigs. . My clue re-"old time religion"= his religious proclivities. "It's a lovely day for drinking" From the chorus of the musical Candide's song Auto Da Fe. The show, of course, was Saturday Night Live, which would usually be airing between the two times of my posts (at least on the west coast). By pointing out that this person used to be a regular on this show, but now besides that it wasn't even on that night (due to the Olympics), I was giving an example of what be considered an irony. Just did a "find on page". Right on! How did I ever miss that one? Waiter! I'll have a large Scotch as it pours, and a gin & sardonic for the lady, if you please. Does that suit you, Tina? "As it pours" is an interesting phrase; I suppose once the Scotch has been messed up with some foreign substance, there's no way to "neatify" it. Sorry, but my attention span is not that short. BTW: You neglected to capitalize the first letter of your sentence along with failing to end with a period. I point this out due to this puzzle being about the Periodic Table. SDB u need to get out more. try SDMan. Since u mention it. I began with SDMan, but when I had to switch servers I found it was taken by some usurper. I only wish I could have come up with something unique like say: Unknown. I have a better suggestion. You bring over some quality wine and I'll supply the horsed-overs and we'll discuss it like groan-ups.